Students all over the country are preparing for the biggest dedicated event on their poker calendar with the return of the Grosvenor Casinos UK Student Poker Championship (UKSPC). The event takes place at Grosvenor Casino Coventry in the prestigious Ricoh Arena, with the week-long festival starting Monday, April 22 and the £30 + £7 Main Event kicking off on Wednesday, April 24. MainEventTravel has lots of accommodation options for students near the Ricoh Arena – check out our UKSPC page today. The UKSPC is the largest live student poker tournament in the country and Grosvenor Casinos is excited to welcome new freshers in 2019. The UKSPC Main Event, which is open to all current students and anyone who has been in higher education since September 2015, is hugely popular and regularly attracts huge fields with winners scooping five-figure prizes. 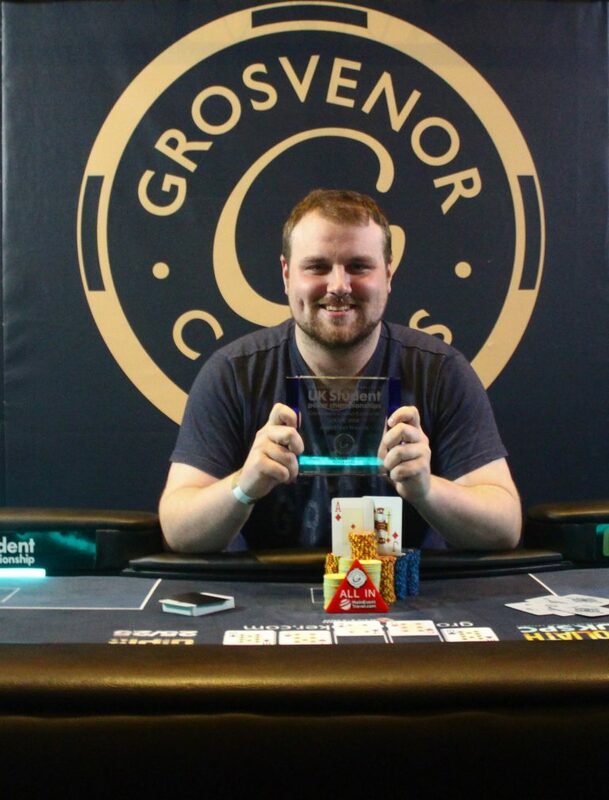 Last year’s event saw British student Gareth Creswell beat a field of 897 fellow academics to win £6,760 in the £30 + £7 buy-in tournament. It was by far his biggest cash in live poker tournaments, but he plays regularly at events in the Midlands and has 15 cashes to his name since 2016. Simon Steedman, who has now found a career in poker and works for Unibet, finished 15th. A packed schedule at the Ricoh includes numerous student-only events including a £50+£7 Heads-Up Championship, the £50 + £7 UKSPC 6-Max, a £200 + £25 High Roller and the £100 + £15 UKSPC Challenge Cup. However you don’t have to be a student to attend the UKSPC with many side events open to all including a £30 + £7 Win the Button,£60 + £14 Tag Team event, £30 + £7 8-max PLO, and £30 + £7 NLH Bounty. The UKSPC has been running since 2015 and this is the fifth edition. Previous winners include Cillian Berragan who took down the inaugural tournament for £5,470, Joseph Kwok in 2016 and law student Dan Welsford in 2017. Welsford had previously finished fifth in the High Roller, and made the final of the Main Event.